Experiencing the great outdoor adventures used to be an immersive experience: just you, the surroundings and a map for guidance. However, our increasing inability to disconnect means we want our tech even when we’re in nature. With the technological advancements, we now have the ability to incorporate Wearable Tech Gadgets seamlessly into our clothing, shoes, even directly on our skin. Here, we take a look at Top Four (4) Best Outdoors Wearables, and the companies making it happen. Although Garmin is a navigation equipment company, many of its most useful products for those going hiking or camping are its selection of SmartWatches. Garmin watches, such as the Fenix models, can support a wide range of outdoor activities. They can measure performance on the go, track activities for sharing and give the user estimates of their fitness level based on their performance and heart rate. The Garmin Fenix 3 watch comes with comprehensive navigation and tracking functionalities, which can guide the user on and off the beaten track. Users can even mark locations, such as a start/ finish line, checkpoints and the location of their campsite. Telecoms provider Orange have partnered with renewable energy experts GotWind to solve the problem of where to charge your mobile phone when going camping. 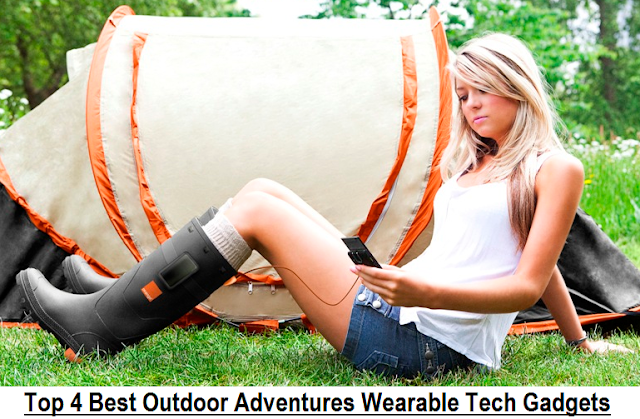 The revolutionary Orange Power Wellies allow campers to charge their phone in a convenient and eco-friendly manner, in addition to keeping their feet dry! The unique power generating sole collects the heat from your feet throughout the day and converts it into electricity. The wellies do this through a process called the “Seebeck” effect, which uses n-type and p-type semiconductor materials, forming a series of thermocouples which are electrically connected. They are sandwiched in between two ceramic wafers, and when the heat of your foot and the cold of the ground are applied at once, electricity is generated. You can then charge your phone by plugging it into the power output at the top of the welly. There’s now a way that science can prevent mosquito bites, thanks to a partnership between Olfactor Laboratories and the University of California at Riverside. The small colourful sticker – called The Kite Patch – can be applied to your clothes and can repel mosquitos for up to 48 hours. Its patent-pending formula uses non-toxic compounds that blocks the mosquito's’ ability to find humans through CO2, making the wearer of the patch “invisible” to mosquitos. Another telecoms company, Vodafone, have worked with the Electronics and Computer Science Department at the University of Southampton to combat the problem of how to charge your phone while camping. Vodafone have created one of the best Wearable Tech Gadget called Power Pocket, built into the Recharge sleeping bag and Power shorts which enables users to charge their mobile phones without access to a plug socket. Both products use thermoelectric material to convert body heat (and body movement in the case of the shorts) into electricity. Eight hours in the Recharge sleeping bag can keep your phone charged for 11 hours, and a day of walking in the Power shorts can give you 4 hours. Flexible display manufacturers like FlexEnable, and all above mentioned companies are working hard to make Wearables more human-friendly.